Well I have finally done it – my first video demo on YouTube – eek. I am showing the new tool from Gina which enables you to create the little Japanese hanging decorations (Hishikazari – Dragon Boats). I have shown how to wrap them with thread and also how to treat them with Powertex if you want to make them more robust and use them in key rings, jewellery or bag charms etc. I have a lot of Tech still to learn with video making – but here is a start to my new ventures on YouTube: – Video Link to Hishikazari demo. I will blog and share a range of my finished projects soon x. Good morning. 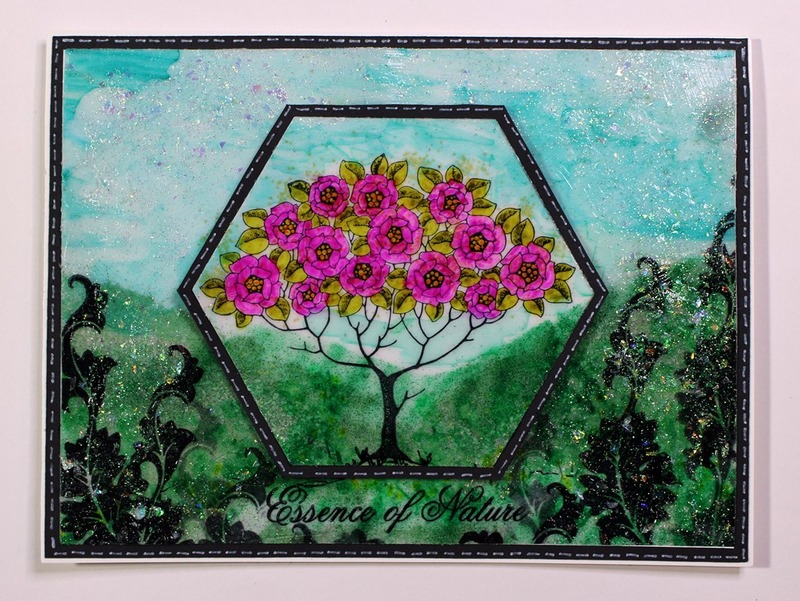 Today I am sharing a couple of projects using the Rose Tree and Essence of Nature stamp sets from Chocolate Baroque. My first is a surreal dreamlike scene using the pretty rose tree as the main focal point. The theme of this week’s Simon Says Stamp Challenge (Wed) is ‘use more than one stamp’ – so I have entered this one. 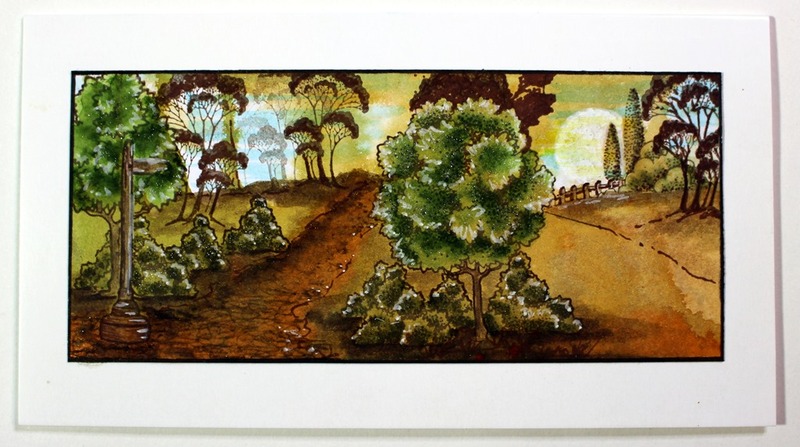 The scene was stamped onto the acetate using StazOn ink. Colouring was added to the reverse using alcohol ink pens. Strips of copy paper were used as a mask and alcohol ink spritzed using a bulb attachment for pens. Basically air is blown across the pen tip by squeezing the bulb, creating a spray. Some colour was dabbed away from the sky area using nail varnish remover. Double sided sticky sheet was then placed on the back and coloured glitters were dropped onto the scene, burnishing into the sticky sheet using a finger. A die was then used to cut out a hexagon shape from the centre of the scene. 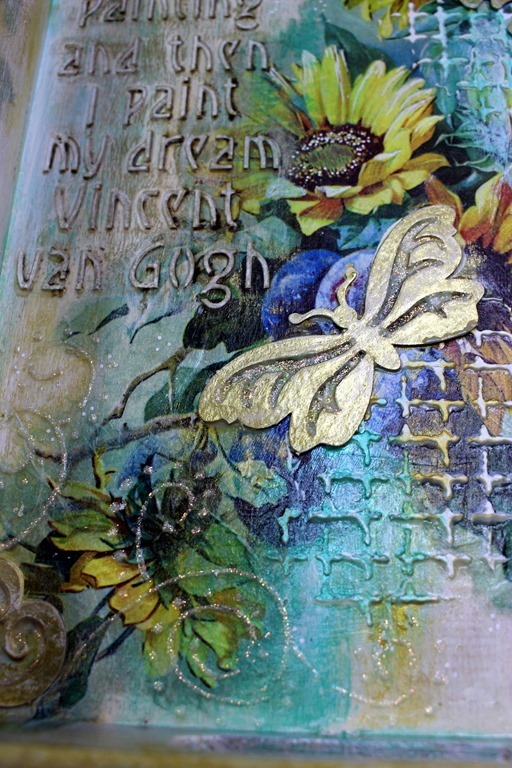 A little Kristall Gel was applied to the background panel for added texture and sparkle. White card was trimmed and glued to the back to make the images stand out. These were then backed with black card to create a border around the background and hexagon cut shape. White faux stitching was added to frame the images. 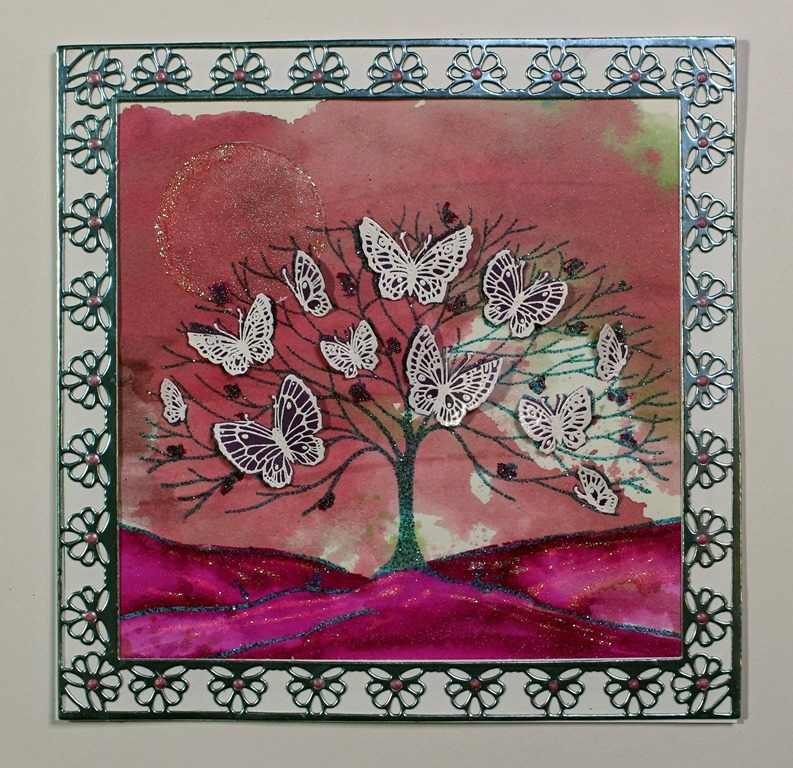 My second project uses the lovely butterfly tree as the main focus to create another dreamy scene. The background was created using ink spritzers. 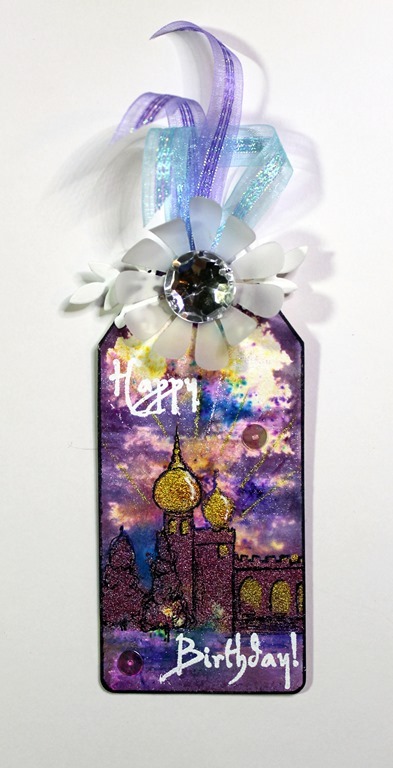 The image was stamped with Versamark, embossed with sparkly powder and coloured with sparkle pens. 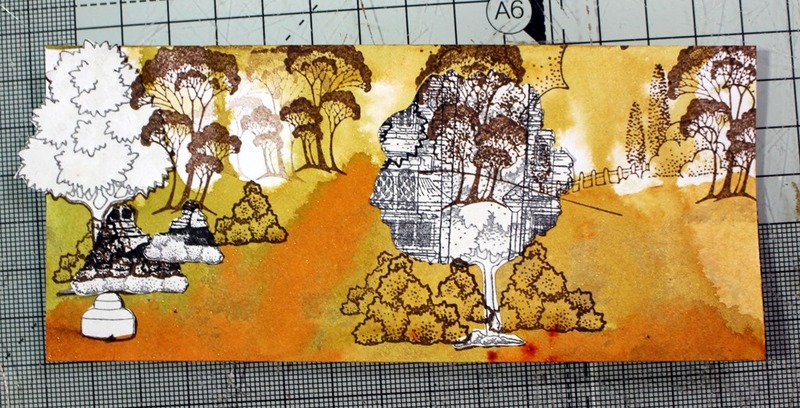 The embossing pen was used to draw in extra hills extending the scene and anchoring the tree. The image was stamped again onto the vellum, embossed with white powder. The butterflies were cut out, shaped and glued onto the tree. The image was then framed with the decorative die cut and finished with glitter glue and PVA pearls. 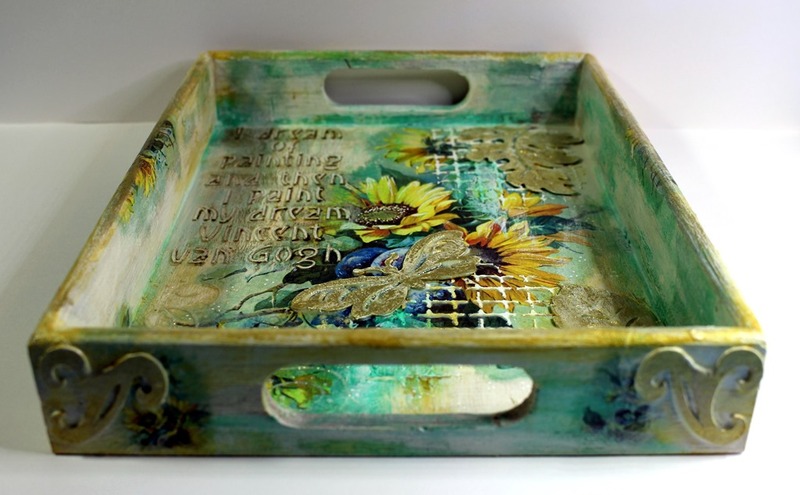 Today I am sharing a decorated recycled Balsa wood cheese tray (19 X 25cm) left over from Christmas. 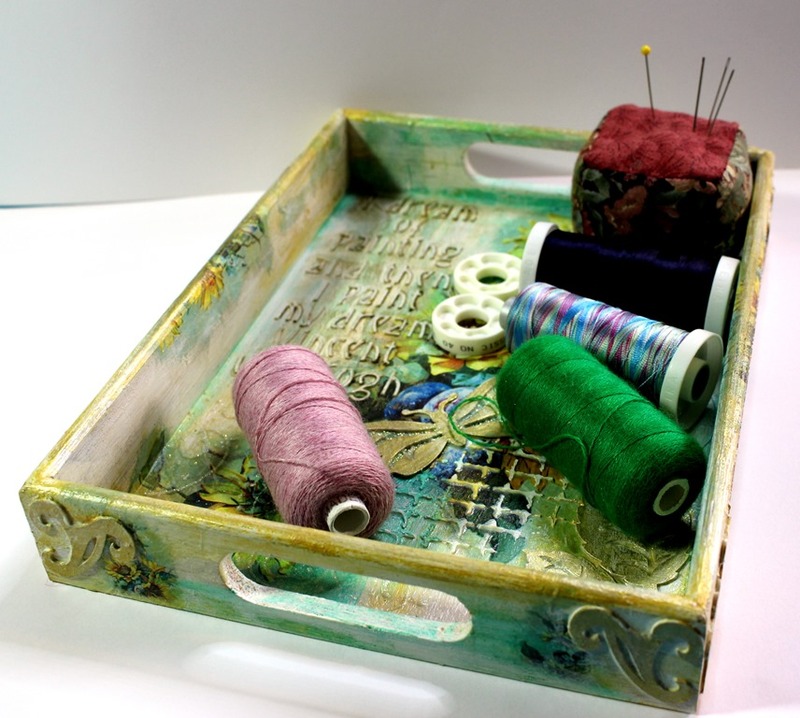 I needed a small project tray to collect together all my embroidery and sewing thread spools when working on one of my textile stitched paintings. I kept the 3D texture to a minimum as I didn’t want my fine threads catching and pulling on anything. The theme for this Weeks Simon Says Stamp Blog Challenge (Wed) is ‘Anything Goes’ so I have entered this one. 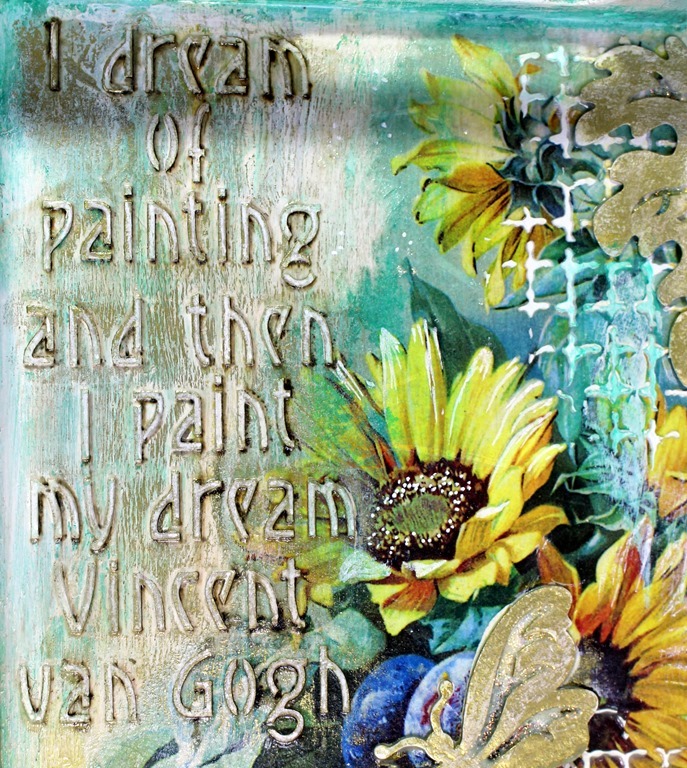 I chose one of the lovely Floral Rice Papers and the fab Duo Arty Quotes Mini Stencil from Powertex to decorate. I wanted to create something that would give me some ‘arty’ inspiration. I had a few grey board embellishments in my stash (from ……) so added these too for a bit of interest. I first used a water pen to dampen around the images enabling them to be torn and separated to form soft edged pieces that will blend into the background once decoupaged. I coated the whole tray with Ivory Powertex and dried using a hair dryer. 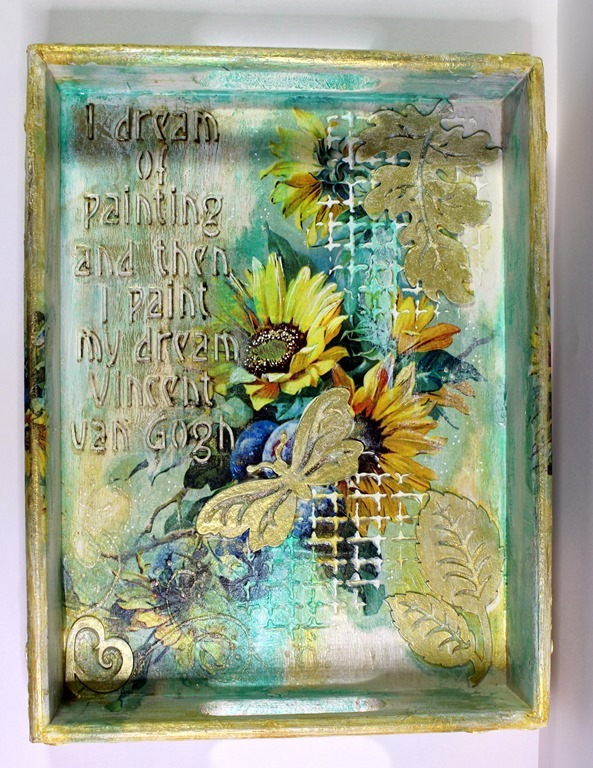 This provided a light background for the decoupage elements. Coating the tray with Powertex hardened up the soft Balsa wood and sealed it making it easier to keep clean too. I also coated the grey board elements with Ivory Powertex. Decorative papers were then applied using Easy Coat Mat. Easy Structure Paste was then applied through the stencil using a recycled bank card. 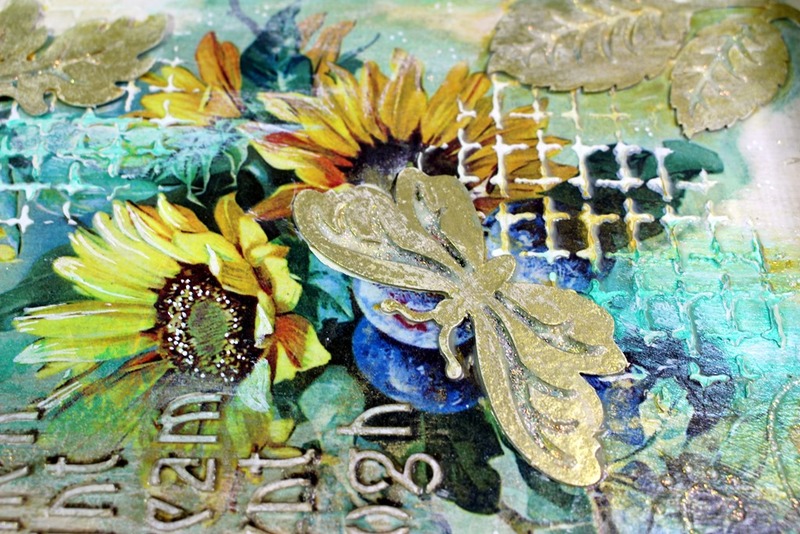 I also added a little more texture using a grid stencil from my stash. The embellishments were stuck down with more Powertex and a little Easy Structure Paste where needed (i.e. onto textured areas). In the background you can see a sneak peek of my next project in progress. I like to work on several things at once so that I don’t waste time waiting for layers to dry. Next I used a white opaque pen (acrylic paint pen) to draw extra highlights onto the main sunflower image. Then I used the new transparent acrylic inks to brush over and add a bit of colour. These are fabulous as being transparent they don’t obliterate the layers beneath. 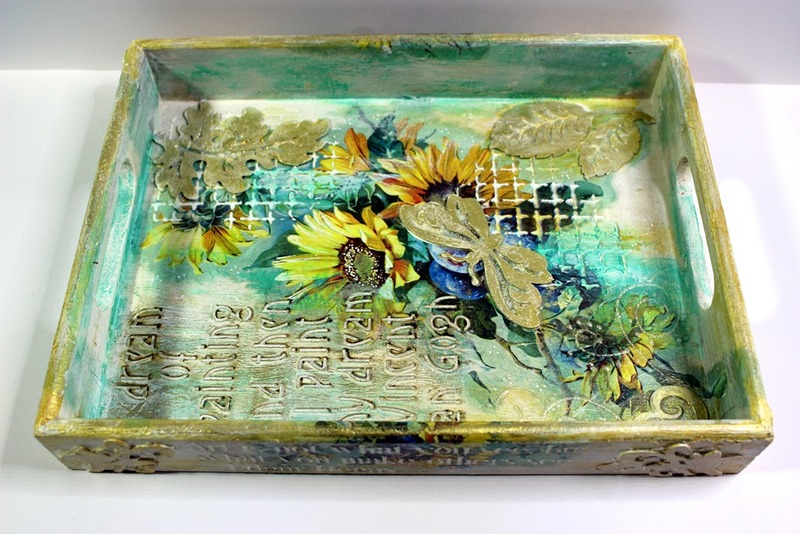 I chose the Golden Metallic and Aqua Metallic Inks to blend in with the main colour theme of the decoupaged images and to add a little sheen. I emphasized the lettering using a brown fine tipped pen (suitable for going onto acrylic). Where needed I also rubbed over a little more Ivory Powertex using my finger to blend in the colouring where I thought it was a bit heavy. I also rubbed on a little gold gilding wax from my stash (Pebeo). Finally I added a little clear PVA based glitter glue to bring a little sparkle. I just couldn’t help myself. Once dry I brushed over the whole tray with Easy Varnish. 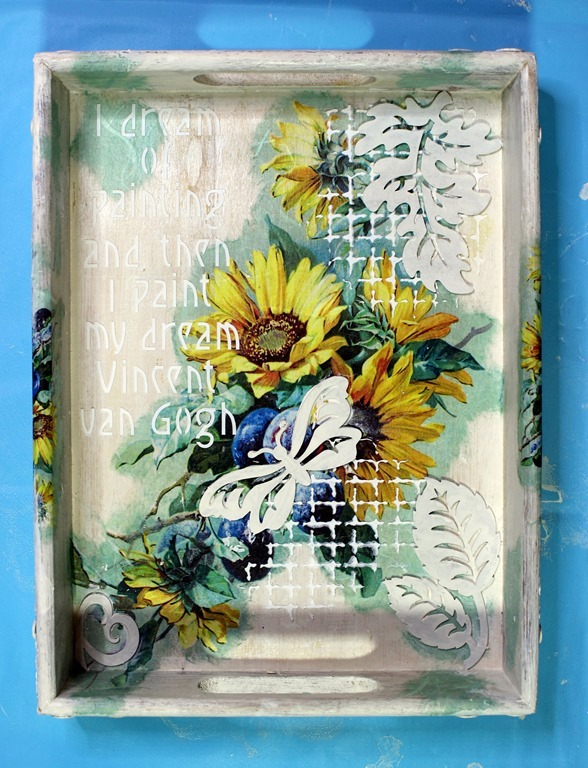 Now I have a lovely inspirational project tray. Hope that you like it too. Good afternoon. 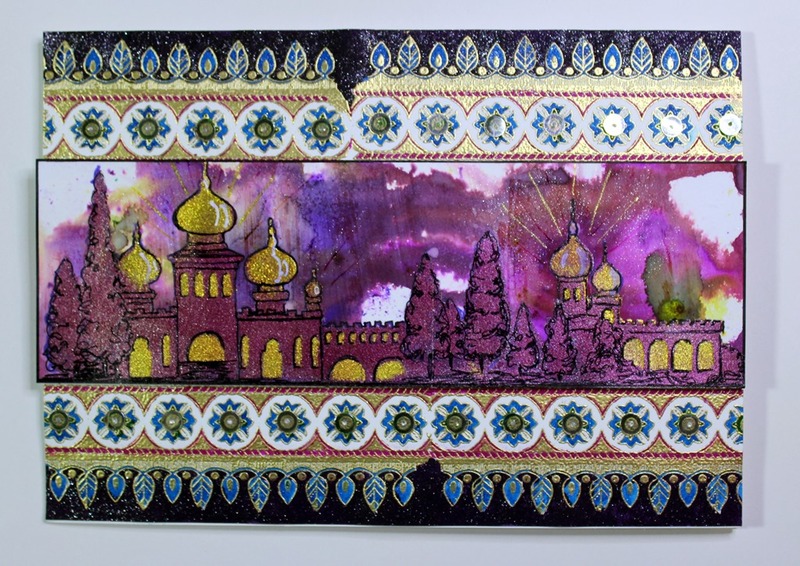 Today I am sharing two variations of a card created with Chocolate Baroque stamps and a pretty background paper from Crafty Individuals. 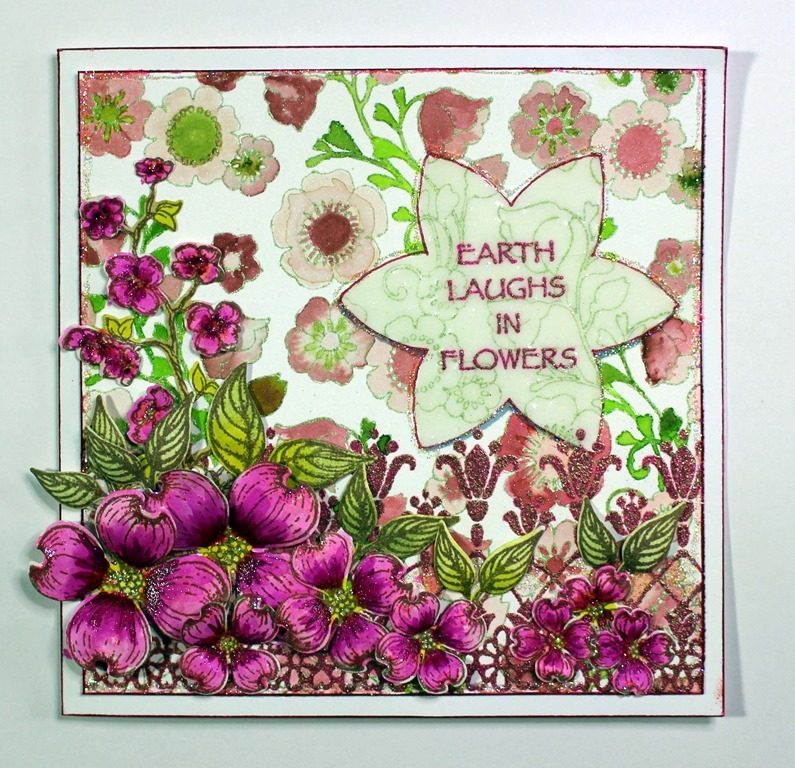 The theme for this week’s Simon Says Stamp Challenge (Mon) is ‘Flower Power’ – so I have entered this one. I have entered the other into the Simon Says Stamp (Wed) Challenge as ‘Anything Goes’. Kraft card was trimmed and mounted onto the card front and faux stitching added with fine tipped pen. 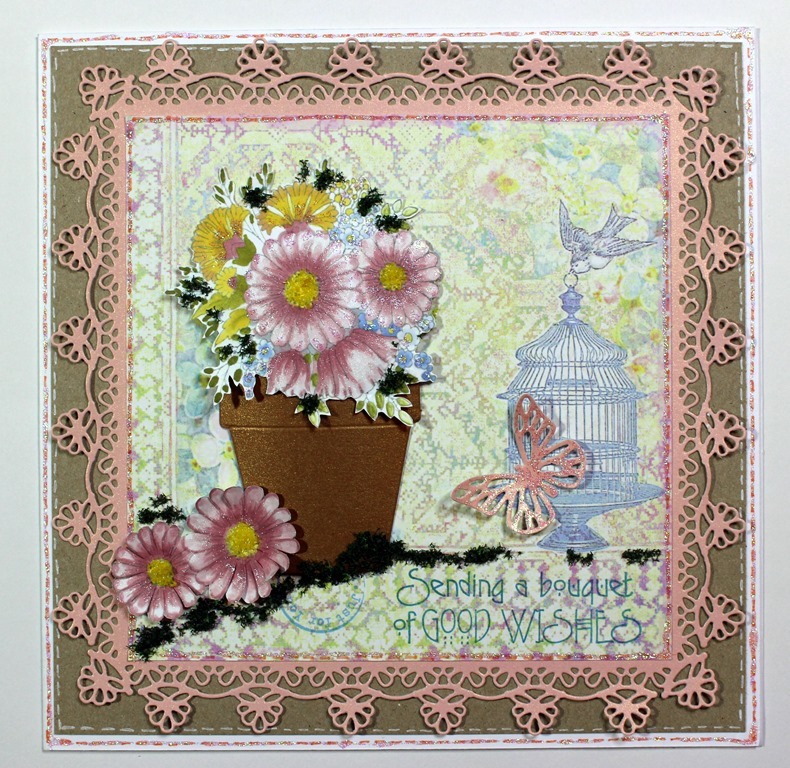 The lace mats were cut from pink card and decorative background paper glued in place. The butterfly was also cut from pink card. Sentiments were stamped with Distress Ink. The flower pot was cut from pearl brown card and lightly shaped before gluing with 3D glue gel. The flowers were stamped with Memento Ink and coloured with alcohol pens. 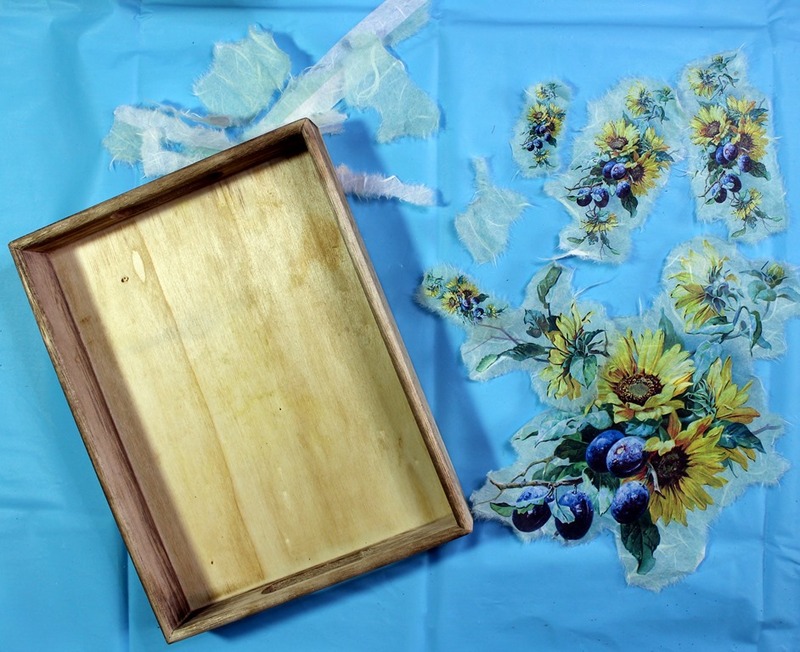 The floral spray and individual flowers were cut out for decoupage, lightly shaped before gluing down using 3D glue gel. A little clar sparkle pen was brushed over the flowers for sparkle. The bumble bees were stamped with Versafine, coloured with watercolour pens and cut out. Yellow Flowersoft was glued into the flower centres, green onto some of the leaves and onto the foreground (to ‘ground’ the pots). Finished with touches of glitter glue for added sparkle. A birthday card that I made for a friend that loves pink and flowers. I stamped the background with Versamark ink and heat embossed with green powder. The sentiment and border were stamped with Versamark and heat embossed with the pink powder. I used a large floral die as a template to draw around using a fine tipped glitter pen. The background image was coloured with watercolour and glitter pens, using a damp brush to blend out colours. Grey alcohol marker was used to add a little shading under the sentiment plate to make it appear more 3D. Pink alcohol pen was used to edge the card blank and background panel before gluing down. Next I stamped the flowers and leaves with Versafine Ink. These were cut out with dies and coloured with watercolour pens. 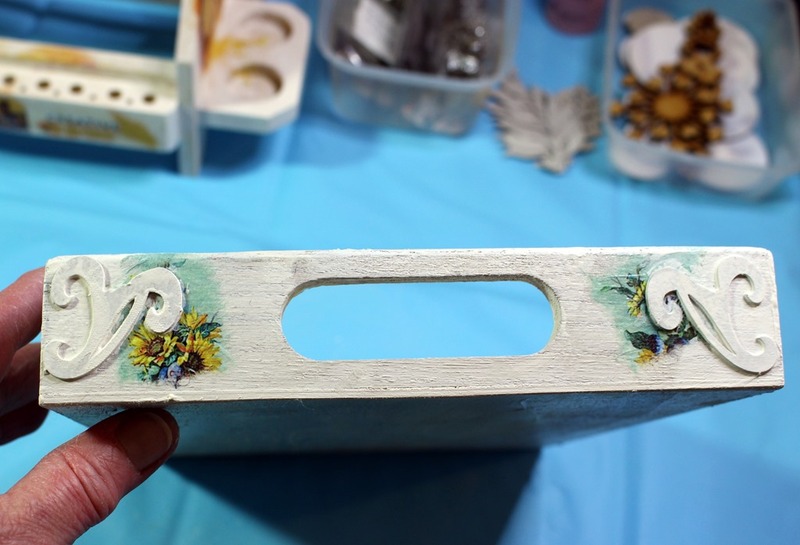 I used balls tools and a spongy mat to shape and add dimension to the embellishments. I finished by applying Glossy Accents over the sentiment plate plus extra sparkle with clear glitter glue. Good evening. 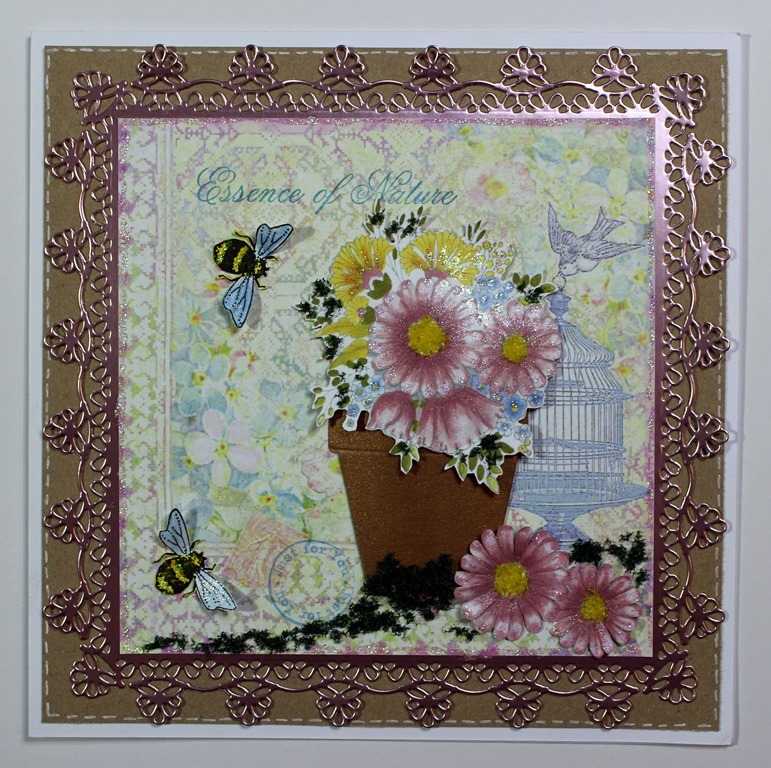 I created this scene using several scene building stamp sets from Chocolate Baroque. Brown, green and gold inks were picked up from left over inks on my craft mat (spritzed with water). I try to do this with any leftovers so that I collect some inked background papers to use in future projects. I thought that this one would make a nice base for a landscape. I stamped the sign post, trees and bushes onto scrap copy paper and cut them out to create masks for stamping. I applied a couple of dots of zig glue to the backs and left to dry (it dries clear to give a removable tac). I then keep the masks in my stash as they can be reused many times. Chocolate Baroque also do masking tissue which already has a cling back for this purpose. I stamped the scene with Versafine working from the foreground, masking images before working images further back. At this stage it looks a bit of a mess. The fine tipped pen was then used to draw in elements to ‘make sense’ of the scene. Colouring was added using watercolour pens, dragging out colour with a damp brush to give shading. A sinking sun was drawn on with a brush and water, and colour blotted away. A little clear sparkle pen was added for shimmer. The card was edged with alcohol maker to frame. Finally highlights were added with a white pen.